With an increasing demand for air travel, new aircraft orders and growing business jet sector, the growth trends for the Aviation industry look strong. 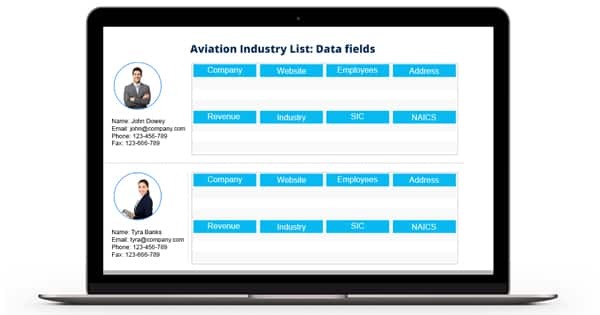 If you are an OEM manufacturer, Aircraft Engineering Company, Software, Solutions and Services provider in the highly risky yet rewarding Aviation industry, Blue Mail Media’s Aviation Industry Database can help you reach top decision makers to efficiently market your offerings. Blue Mail Media follows a stringent process to maintain the accuracy and reliability of data. Our team of data specialists, experts and professionals collect data from authentic sources, verify it for accuracy and update the same on a constant basis. Also, we provide pre-packaged as well as customized Aviation Industry Email List that aligns perfectly with your marketing goals. Blue Mail Media has a strong partner network across geographies such as North America, Europe, Africa, Middle East, APAC and South America. This gives us an extra edge in serving clients in a local yet global approach. Our Aviation Industry Executives Mailing List will give you the much needed push you are looking to shore up your marketing efforts. Our Aviation Executives Email List can significantly help attain new levels in your marketing drive. Our marketing list has been designed to help you achieve your multi-channel marketing objectives with a lot of ease. It allows you to connect with your B2B target audience via telephone, email or mail with complete access to all the information you may need to do the same.